Who doesn’t love a scone? You can pretty much get them in any flavor and get super creative when making them. My mother in law is a scone aficionado (if there is such a thing, haha) so she is usually my taste tester when it comes to making the perfect scone. If she says they are good then I know they are done right. In this recipe for a savory scone I wanted to use the best of the best when it came to butter and cheese. I used one of my favorite brands Kerrygold. I went ahead and used Skellig Sweet Cheddar cheese,Unsalted Kerrygold Irish Butter, Garlic & Herb butter. They were the perfect start to a cold Sunday morning. I hope you enjoy! Traditionally scones were a way of using up sour milk or buttermilk, so I love that you’ve used cream instead! I expect it makes them taste really rich and luxurious! I’ll share this with my wife. 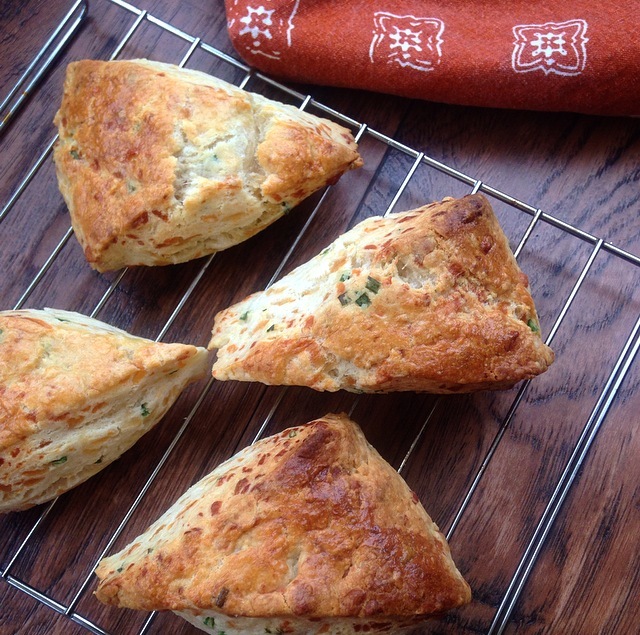 She makes some killer mini-bacon cheddar scallion scones, but a larger version seems like a good choice. Can’t go wrong with those ingredients! They look great! I never go the savory route for scones, but these look delicious! Thanks for sharing!! !